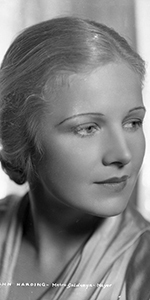 Ann Harding was an up-and-coming M-G-M star at the time of her footprinting ceremony. She went on to have a considerable career in films, on stage, radio and television. Born into an Army family, young Dorothy was schooled in East Orange, New Jersey, then attended Bryn Mawr in Pennsylvania. She broke into show business initially as a script reader. Ann made her Broadway debut in Like a King in 1921. By 1924, she became a regular player at the Hedgerow Theatre in Rose Valley, Pennsylvania, where she was directed and tutored by Jasper Deeter. Harding became a prominent player on the stages of Pittsburgh, where she acted with and married Harry Bannister in 1926. She played the lead character in the Broadway play The Trail of Mary Dugan in 1927, but it was not a success. However, she was well-known enough, and was signed to a contract to headline in films for Pathé. Her first film for them was Paris Bound with Fredric March (released in April, 1929), followed by Her Private Affair co-starring with her husband Harry Bannister (released in September, 1929). With Pathé unproductive as they slid toward their fated merger with R-K-O, Harding was loaned out to other studios. For Sam Goldwyn, she co-starred with Ronald Coleman in Condemned (which played the Chinese in December, 1929), then, brought back to Pathé for the comedy Holiday (released in July, 1930) for which and she was nominated for the Best Actress Oscar. Harding was doing so well in films, and so grateful for her stage training, that she bought the Hedgerow Theatre and donated it to her acting mentor, Jasper Deeter. The Hedgerow Theatre is open today. An interesting aspect of Ms. Harding's Forecourt ceremony is that Jean Klossner, the man who prepaired all of the cement blocks and finished them for posterity, had Harding sign a five dollar bill, as it was the only piece of paper he had on him. Klossner kept up the tradition, and for each celebrity he imprinted, he had them sign a dollar bill. Harding then made The Girl of the Golden West with hubby Harry Bannister playing the heavy (released in October, 1930), for First-National in 1930, and East Lynne with Clive Brook (released in March, 1931) for Fox. By now, Harding was enfolded into the R-K-O studio, starring in such films as: Devotion with Leslie Howard (released in September, 1931), The Animal Kingdon again with Leslie Howard (released in December, 1932), When Ladies Meet with Robert Montgomery (released in June, 1933), The Right to Romance with Robert Young (released in November, 1933), The Life of Vergie Winters with John Boles (released in June, 1934), Biography of a Bachelor Girl with Robert Montgomery again (released in January, 1935), The Flame Within with Herbert Marshall (released in May, 1935), and Peter Ibbetson with Cary Cooper (released in November, 1935). And then, Harding decided to give up the picture business. She was tired of playing the same part over and over. After co-starring with Walter Abel in The Witness Chair in 1936, Harding lit out, making a low-budget indie thriller, A Night of Terror with Basil Rathbone in 1937. After that, Harding married conductor Hans Werner Janssen, moving to Baltimore where Janssen led the Symphony there. Janssen wanted to write music for films, so back to Hollywood they went, with Harding accepting second-string roles in a variety of films like, Mission to Moscow (released in May, 1943), The Magnificent Yankee (released in December, 1950) as well as The Man in the Gray Flannel Suit (which played the Chinese in April, 1956). She also appeared on early television shows such as Schlitz Playhouse, Lux Video Theatre, Studio 57, General Electric Theatre, and into the early 1960s. Divorced from Janssen in 1962, Harding died in 1981 at the age of 79. Grauman's Chinese Theatre, Hollywood, California. Ann Harding Forecourt ceremony, Saturday, August 30, 1930. 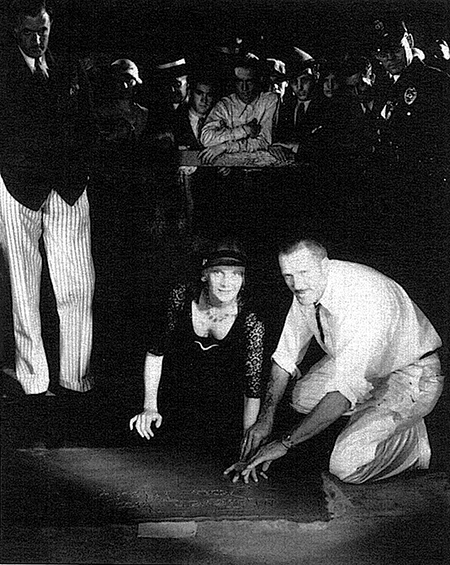 Harding's husband Harry Bannister stands to the left, while she is assisted in making her impressions by cement artist Jean Klossner on the right.